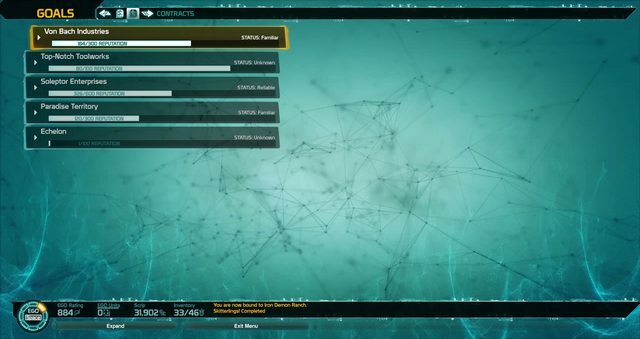 Contracts are unlocked at EGO rating 175. They are daily and weekly missions that award reputation with different Factions. Trion have also written a post about Contracts. You access Contracts from the EGO menu. Select GOALs. 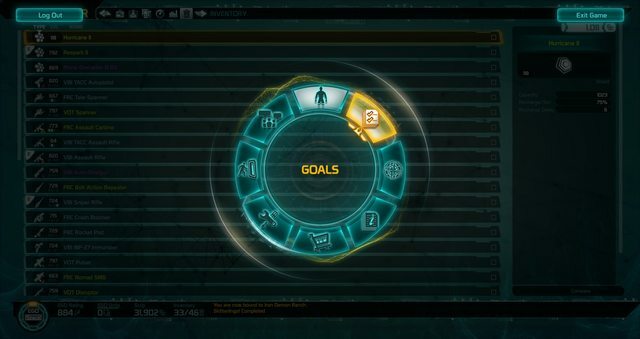 From the GOALs screen select CONTRACTS from the top-left. 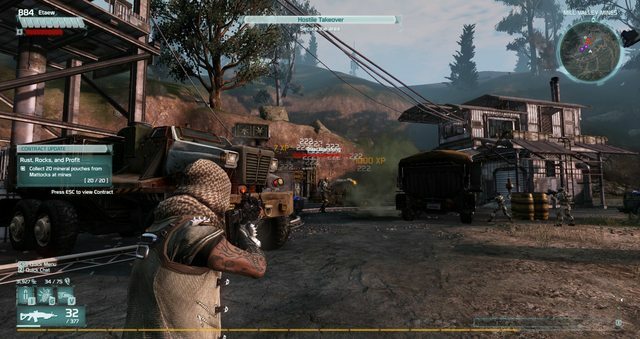 A list of Factions are displayed. Click on one to display the contracts from them. The objective is displayed on the right, and the time remaining. To complete a contract, just go and do what it asks. When you have completed it, you will receive credit for it. If you have not completed a contract when the reset time comes, and you have progress on it, you will be rewarded based on your progress. 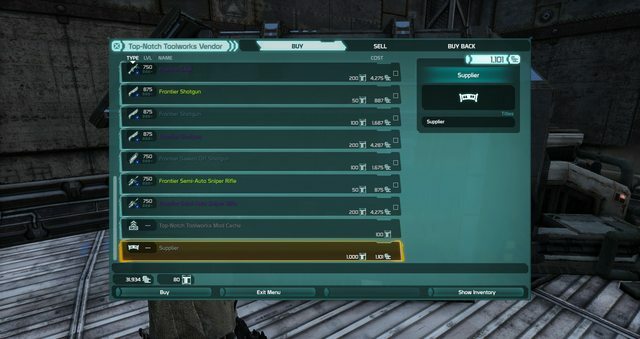 You can visit Faction vendors to spend some of your Reputation for items in their store for equipment, mods and titles. Reputation as Currency: Buying items from the vendors removes faction reputation, it is used as currency. Your reputation status will not decrease, but the currency points you have will. 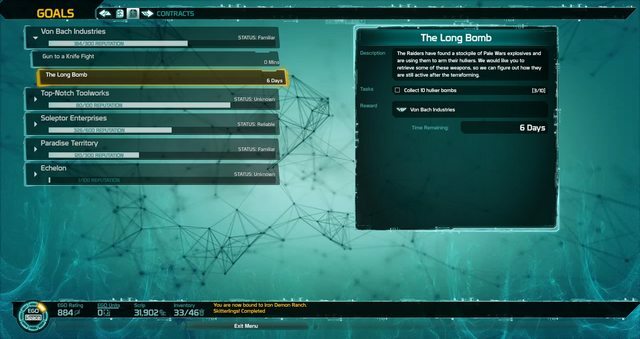 Cap: The maximum amount of reputation you can have at once is 1000, any contracts completed will not award reputation past this point until you spend it. Question, I somehow got a contract started with the Tarr family. I have no idea where i am to go to do it as there is nothing on the map about it. When you take a contract is it suppose to show up on the map like a mission? Showing you where to go to complete it? How do you start a contract? I saw a icon on the map for a contract about the radio towers but i have no idea how to start them. Generally it's just go somewhere and do a thing. Ones pointing you to a radio tower might require you to complete the conflict site. Ok well i went and cleared the towers, again as i had already done a mission on the same area, and it did complete the contract. Thank you i was thinking you had to talk to someone to start them up like you do missions. Well makes them all pretty simple then. The first reputation rank is called "Neutral"
You may want to add a note that that the previous requirement for contrcts was 250 (with a link to the patchlog when it was changed, it should be on forums). It's also worth adding that you should not worry that when you spend your reputation points you will have to wait longer for pursuits. There are two separate counters for the reputation points - the one you see is spendable points you spend in vendors, the other one is invisible and just keeps track on how many points you accumulated total on that character - that way you can be trusted with let's say just 400 points shown in the contract page. Thanks, yeah I've added a note about the 1000 cap. You should add a note that the maximum amount of points you can accumuate is 1000. If you get over it, the exceding points are wasted. So apparently group credit is back. I'm at the overpass in SF, waiting for a salvage to finish up, and I keep getting credit for the "kill dark matter forces" contract every so often. Thank you, random people who are killing Dark Matter enemies somewhere near me! When servers restart (due to a patch, or crash) sometimes you will get a new set of contracts. So....are there weekday and then weekend contracts? I just got a new set of weeklys, and unless I'm in some sort of alternate universe, it's not 3PM EST Monday.